Synopsis: Duncan has always been a pretty boring guy, leading a simple life while working at a bread factory. Then he stumbles upon Brenda, a sad young woman who’s about to end her life. Convinced he’s fallen in love, Duncan strikes up a desperate deal: if he can get her to laugh, she’ll give life another shot, but if she doesn’t even giggle, he’ll help her go through with her plan. There’s just one catch: Duncan isn’t funny. At all. So he borrows Pat, his second-favourite comedian, to help him come up with the perfect routine. But Pat is having a hard time mustering his sense of humour after a bad break-up, and the last thing he wants to do is teach a lonely loser the difference between knock-knock jokes and schadenfreude while chained to a typewriter. A tragicomedy of three misfits, Punch Up navigates a hostage situation and a life-or-death comedy lesson to show just how far we’ll go for a laugh. Dark, hilarious, and full of promise for a really cool performance. 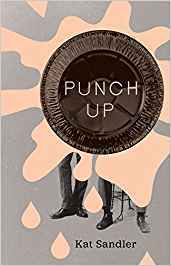 Punch Up was quite the quirky read. Don’t get me wrong, it is dark. Very dark. The main plot of the play is that Duncan comes across a woman who is trying to kill herself and convinces her to wait day, have dinner with him, and see if he can make her laugh. If he fails to make her laugh, he promises to help her kill herself. Meanwhile, Duncan grabs Pat, a washed up comedian, to help him. But Pat is also going through a life crisis. And neither of them are funny. Or at least, not when they try to be funny. The dialogue is punchy. It is witty, and fun, and frankly, absolutely hilarious. The jokes are so bad, they are gut-bustingly laughable. The scene set ups are easy to follow and easy to visualize. I could see this play in my mind. See the characters. See how the stage was set up, see the characters moving from scene to scene, see the way lighting and sound could enhance the situations. Punch Up, is worth your time. If anyone stages it near me, please let me know — I want to come watch! What is your favourite dark comedy?